1000s of sweetly fragrant blooms all summer long. A magnet for butterflies and bees. Will not self seed so it will not spread. Perfect for a pot or small hedge. Incredibly compact, and growing to just 2ft tall, Blue Chip is perfect for patio pots or as a low, colourful and fragrant hedge. The sweetly scented blooms act like magnets for Butterflies, drawing dozens at a time in to your garden all through the summer months. Just like its larger cousins, this new mini variety will attract dozens of beautiful fluttering butterflies to your garden to feed on the sweet nectar from its flowers. Thankfully, one characteristic it doesnt share is the ability to self seed and spread itself round your garden. Simply stunning in a pot on your patio it also makes an equally impressive, low growing, scented hedge. Just imagine walking up your garden path and being greeted with a cloud of heady Buddleia fragrance! 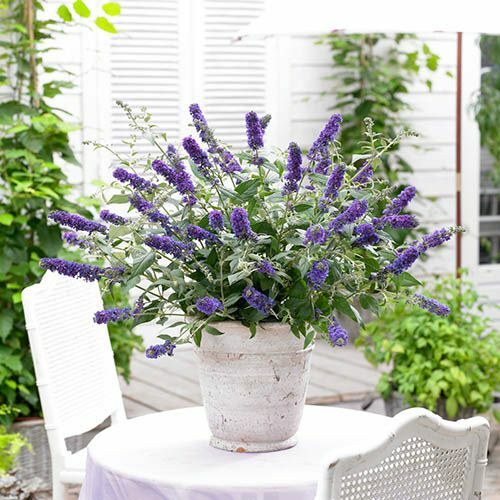 Easy to grow, incredibly low maintenance and a great garden performer, Dwarf Buddleia Blue Chip is one of this years must have plants! Supplied as 3 established plants in 9cm pots. Height after 5 years approx 75cm (2ft). Spread after 5 years approx 1m (3ft). Flowers from late June to September. Keep removing dead flowers for a longer season.